Bob Lutz said the Alpha Jet is a demanding airplane that requires a heightened state of awareness of the angle of attack at all times. Although he’s pleased with that label, there are others that are just as fitting; he’s definitely a “plane guy” as well. Evidence of both classifications can be found in his GM office, which is filled with car and airplane models. The former Marine captain and jet attack pilot, who is also the author of “Guts: 8 Laws of Business from One of the Most Innovative Business Leaders of our Time,” a popular business management book, says he’s “never fit into the standard mold too well.” He not only flies a helicopter to work, but also gets as many hours as he can in his Czech-built Aero Vodochody L-39 “Albatros” and his West German Dornier A model Alpha Jet. “Some people like golf and I like this,” he said. He affirmed that he bought the L-39 jet trainer, a single-engine, two-seater, subsonic aircraft, because he missed the “adrenaline rush” of military flying. His dreams turned into reality, however, after the collapse of the Soviet Union, when L-39 jet trainers, built as the successor to Czechoslovakia’s earlier trainer, the L-29 “Delfin,” suddenly came on the market. The L-39 kept him contented until last year, when he decided to vary his recreational flying a little and bought the Alpha Jet, a jet fighter. Lutz estimates that between the L-39, the Alpha Jet and his helicopter, he’ll probably be averaging about 180 hours a year. Robert A. Lutz enlisted in the U.S. Marine Corps after a period of youthful restlessness and rebellion. Born in Zurich, Switzerland, on Feb. 12, 1932, he had crossed the Atlantic five times before he was 8 years old, due to his father’s business, and held both Swiss and U.S. citizenship by age 11. His father, a Swiss banker, was continually transferred back and forth between Zurich and Wall Street by his bank, Credit Suisse. The reoccurring upheaval resulted in Lutz often getting behind his Swiss counterparts and being held back in school. His education suffered a further setback after his family finally settled down in the Zurich area following World War II, and he was booted out of the prestigious boarding school he was attending for his high school years. 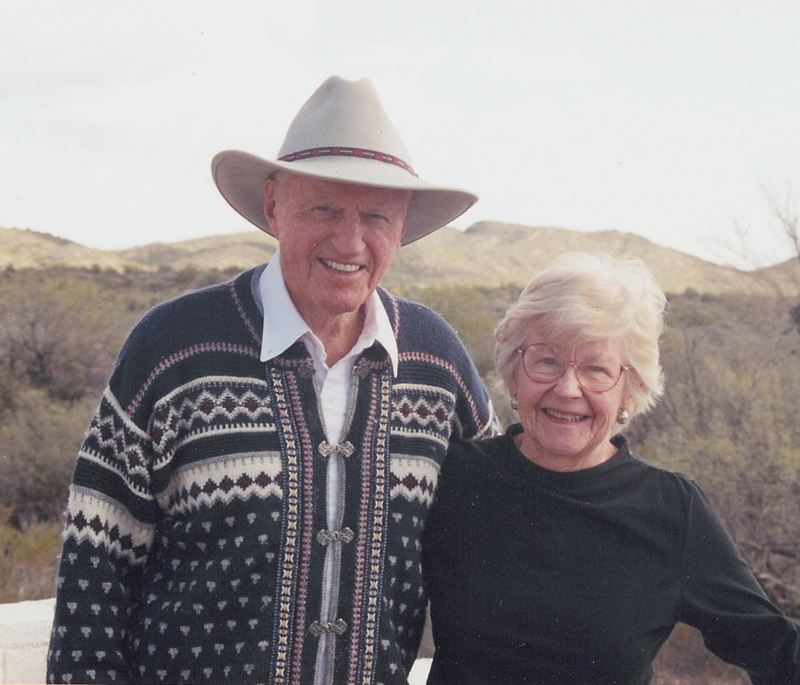 Although the official reason was “academic and disciplinary problems,” Lutz said the real problem was he was more interested in romance than studying. His father’s solution was six months of manual labor in a leather warehouse. He also extracted a promise from his son that in exchange for one more chance at education, at a public school in Lausanne, Switzerland, he would enlist in the U.S. Marine Corps. After 22-year-old Bob Lutz finally got his high school diploma, he made good on his promise to his dad. He didn’t even consider rebelling against that wish, since he had always had an admiration for the Corps, and because of an earlier desire to be a military pilot. 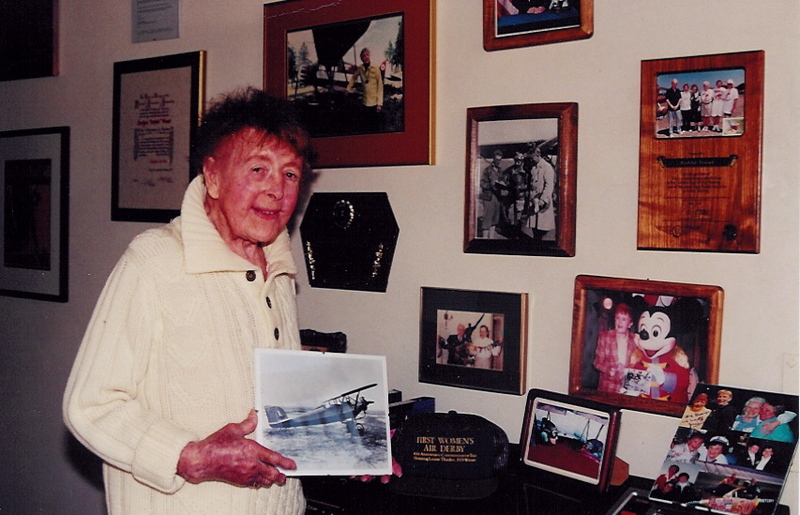 As a youngster in the waning days of WWII, he sketched fighter planes in his school notebook and dreamed of being an ace and flying a P-51 Mustang or a Chance Vought F4U Corsair. His heroes included Joe Foss and Pappy Boyington. 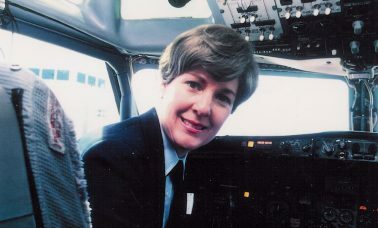 Lutz entered the Naval Aviation Cadet Program (NAVCAD), which was then open to promising enlisted men from the Navy or the Marine Corps, as well as civilians. He received his Wings of Gold as a Marine aviator in 1956, and served on active duty until 1959. The first aircraft Lutz flew during U.S. Navy flight training was the North American SNJ-4. 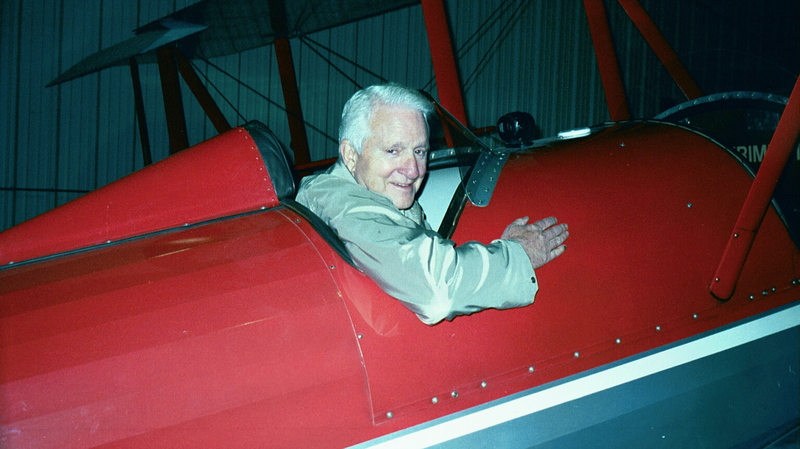 Lutz, who has about 2,500 hours in military aircraft from that period, said the popular trainer was the last propeller-driven aircraft he ever flew. 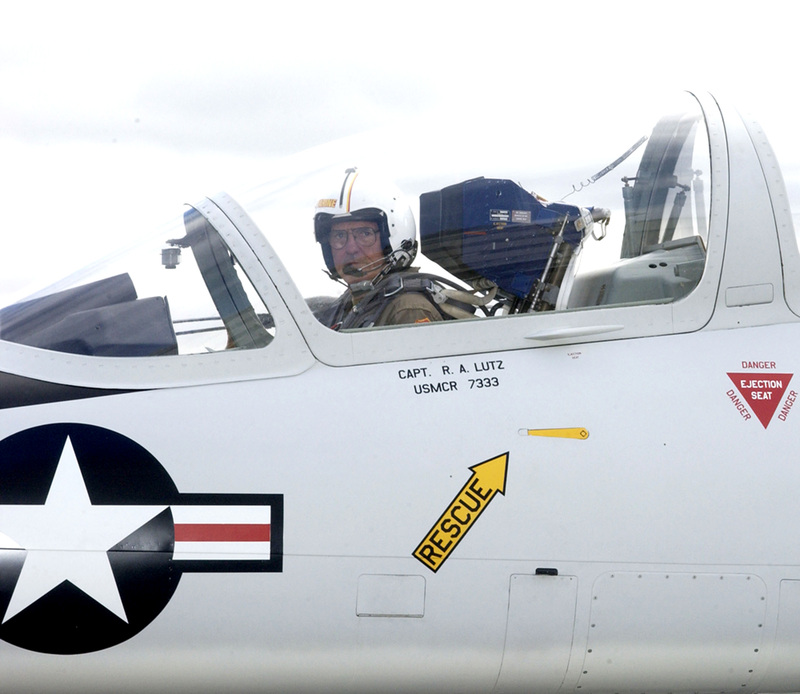 In flight training, after the SNJ, Lutz flew the Lockheed TV-2 (T-33) and the Grumman F9F-5 Panther. 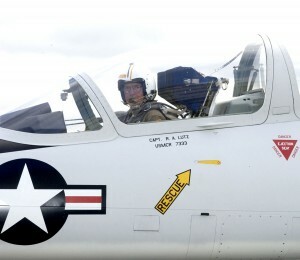 Once out of flight training, he flew aircraft including the McDonnell Douglas A-4 Skyhawk and the McDonnell F2H Banshee. “I also flew the Grumman F9F-8 Cougar with swept wings,” he said. The aircraft he unquestionably enjoyed flying the most was the Douglas A-4. Bob Lutz boards a GM corporate jet at the GMATS terminal at Detroit Metropolitan Wayne County Airport. Trained to be a conventional or nuclear weapons attack pilot, Lutz served in Korea for a time as the air liaison officer of the 2nd Battalion, 3rd Marines, based on Okinawa. 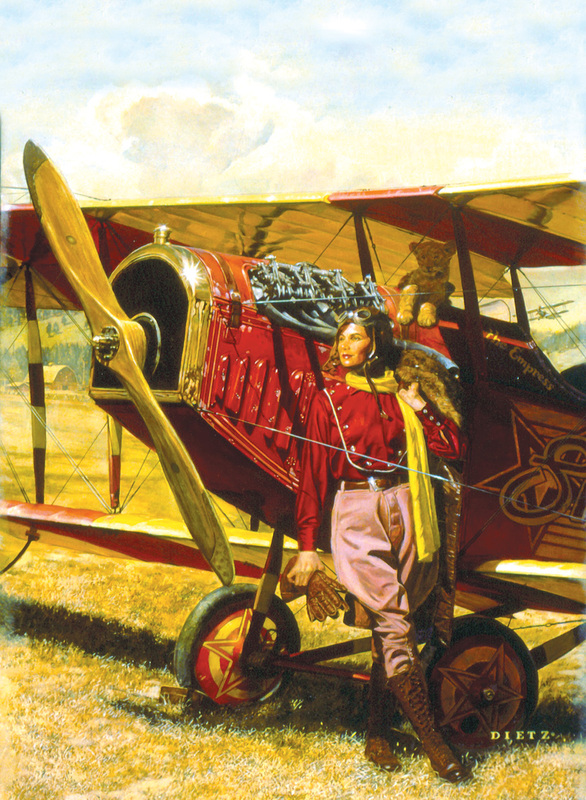 Following his tour in the Far East, he returned to northern California, the site of one of his earlier assignments, to become a Reserve aviator. Lutz was intent on making the military his career, but needed a college degree to advance as an officer. So, while flying in the reserve out of the Alameda Naval Air Station, he entered the University of California at Berkeley. And he started thinking seriously about combining a career in business with his “second” burning passion in life—cars. Like aviation, that love can also be traced to his youth in Switzerland. A couple of rich uncles drove “great, crazy cars,” including a ’34 Alfa Romeo Zagato, a ’38 Talbot Lago Pourtout, and a ’48 Delahaye, and his father wouldn’t think of having a “dull car,” driving models including an SS Jaguar and an Aston Martin DB2. At age 29, Lutz received his bachelor’s degree in production management, in 1961 (earning distinction as a Phi Beta Kappa). He received an MBA (with highest honors) in 1962. Soon after that, he got into the auto industry with a series of marketing and, later, management jobs. He left BMW when he was offered the position of chairman of Ford of Germany. He spent 12 years at Ford Motor Company, where his positions included chairman of Ford of Europe and executive vice president of Ford’s international operations. A member of Ford’s board of directors from 1982 to 1986, for his last position with the company, he was moved to Detroit to serve as executive vice president of truck operations. He said that in those days Chrysler was seen as “sort of the last refuge of automotive malcontents,” and that he pretty much fit that description. He remained with Chrysler Corporation until 1998, becoming a member of the board and ultimately reaching the position of vice chairman. He also served as president and chief operating officer, responsible for Chrysler’s car and truck operations worldwide. He led all of Chrysler’s automotive activities, including sales, marketing, product development, manufacturing, and procurement and supply. His time at Chrysler prompted Lutz to write the first version of his business management book, titled “Guts: The Seven Laws of Business That Made Chrysler the World’s Hottest Car Company,” which was published in 1998. That period was when he also developed the habit of commuting to work in a helicopter. Lutz trained on a Schweizer 300 before getting a Robinson R-22. Lutz decided next on a McDonnell Douglas MD500, which he still has, and bases in Ann Arbor. He’s not the only helicopter pilot in the family; his wife, Denise, has a fixed-wing certificate, but prefers to fly her Bell 206B JetRanger. Although he still flies to work, the commute is slightly different now. His distinguished career with Chrysler ended in 1998, within months of the company’s merger with Daimler-Benz AG, which resulted in DaimlerChrysler. Previous to that merger, Chrysler broke their rule that required executives to retire at 65. Not yet ready to accept a well-deserved “life of ease,” soon after leaving Chrysler, Lutz, 66, became chairman and CEO of Exide, the world’s largest maker of lead-acid batteries. He served as chairman until his resignation on May 17, 2002, and as a member of Exide’s board of directors until May 5, 2004. Lutz rejoined General Motors in September 2001, as vice chairman of product development. In November of that year, he was named chairman of GM North America. He served in that capacity until April 4, 2005, when he assumed responsibility for global product development. Lutz said he’s never regretted that decision he made at Berkeley that led him away from the military and toward the world of business, but as mentioned earlier, he did at one time suffer “occasional anguish” over not flying military aircraft. He says he doesn’t prefer either aircraft over the other. On those days he’d prefer not to be too challenged, Lutz flies the L-39, which he acquired in November 1994 from International Jets, Inc. Former Soviet Air Force Major Alex Makarenko trained him in Gadsden, Ala.
Lutz acquired about 18 hours of dual instruction before soloing the aircraft in May 1995. He said the L-39 is easy to fly, very good at yanking and banking, and is a very forgiving airplane. “It’s like a horse that’s very easy to ride and very predictable,” he said. Lutz currently has about 600 L-39 hours. He acquired his German Alpha Jet last summer from Abbatare Inc., located in Arlington, Wash., at Arlington Airpark. Abbatare, founded by developer Hans von der Hofen, is the only company to have imported German Alpha Jets into the U.S.
After acquiring the jet fighter, Lutz trained at von der Hofen’s Alpha Jets USA. 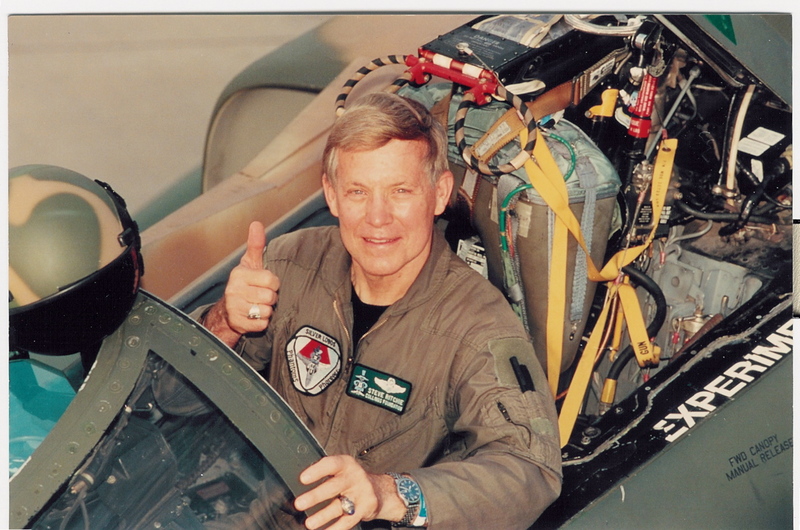 He took his first flight with von der Hofen, and then continued training and got his check ride with the company’s chief pilot, Rick Millson, who served two tours in Vietnam and a tour with the U.S. Navy Blue Angels and is now a corporate pilot. Lutz said he acquired the Alpha Jet for a few reasons, including the simple fact that it was available, it was “almost new,” and it has a reputation for being a very rugged and reliable airplane. Another big reason is that he’d always wanted something that offered higher performance than the L-39. Lutz said the Alpha Jet is a much more demanding airplane that requires a heightened state of awareness of the angle of attack at all times. 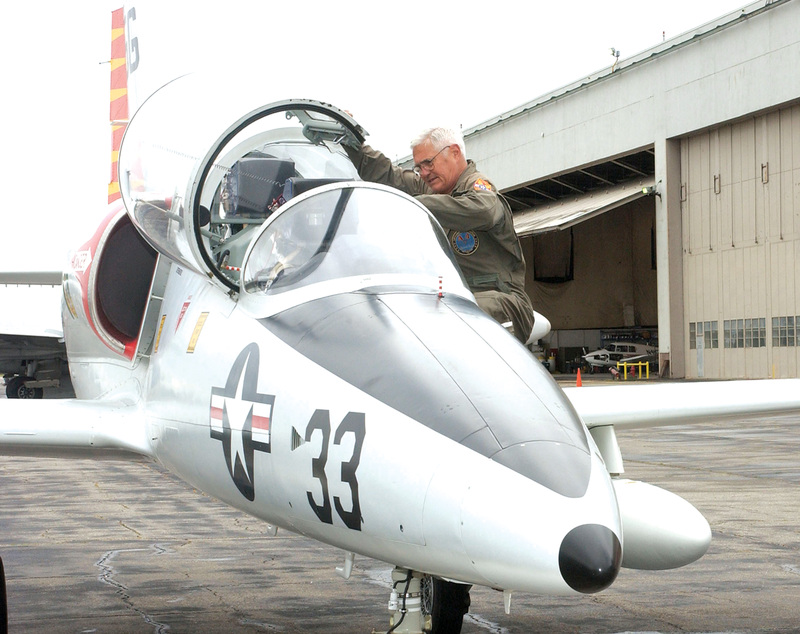 Lutz bases his L-39 at Ypsilanti’s Willow Run Airport. 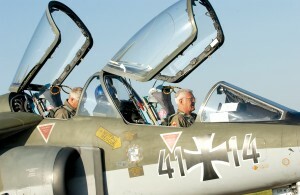 Lutz said he tries to get as much time as he can in both the Albatros and the Alpha Jet. “If I can, I try to fly on both Saturday and Sunday, weather permitting,” he said. With his military background, few would question his ability to fly these jets. But some have questioned if a civilian pilot can fly the same craft safely and proficiently. 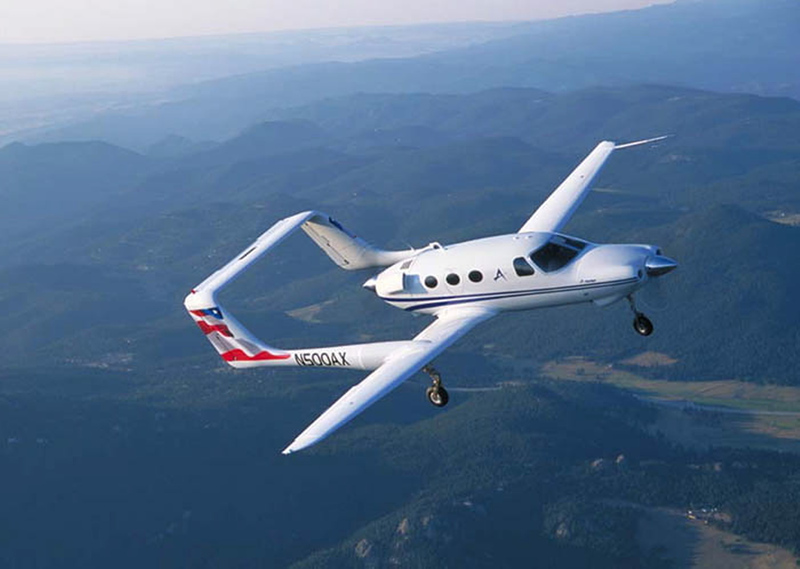 In order to fly one of these aircraft, the FAA has several requirements. He added that nowadays, you no longer get a letter of authority. “You now have to be type certified,” he said. Lutz says that much to his wife’s chagrin, he does not use his L-39 as an “executive jet” for going on trips. Because of that scenario, he says a particularly memorable flight occurred last summer when he flew the L-39 up to northern Michigan with his wife to visit friends. He said the Alpha Jet will be perfect for a trip to Mackinac Island, a resort island near Sault Ste. Marie, where the couple also has friends. He said that with the Alpha Jet, three and a half thousand feet is plenty, both for takeoffs and landings. 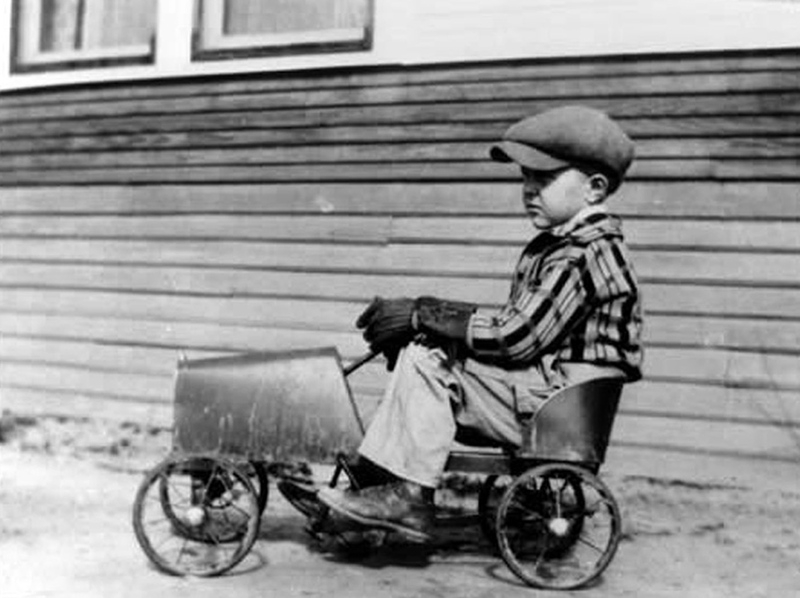 In “Guts,” Lutz tells how his love of interesting cars, “no matter what their price or pedigree,” was something he learned not only from those uncles and his father, but also at his mother’s knee. He explained that his father chose vastly different cars for his wife to drive than what he drove. For example, when his father acquired the SS Jaguar, he acquired a ’37 Czechoslovakian-built Skoda for his wife, believing the Jaguar was “too much car.” Although a “great little car,” Lutz recalled that the clutch and brake pedals were on flimsy castings that came up through the floorboard, resulting in his courageous mother having to stand on the brake pedal on many occasions. Lutz’s extensive car collection of modern and vintage automobiles includes some sentimental favorites, such as two Vipers, and going further back, his father’s 1952 Aston Martin DB2 Vantage. Vintage cars in his eclectic collection include a 1934 La Salle convertible, 1941 Chrysler convertible, 1952 Citroen, 1934 Riley MPH (semiautomatic, aluminum-bodied sports car) and a Steyr-Pinzgauer, a former Swiss military vehicle he got surplus from the Swiss army a few years ago. The list continues with two 1952 Cunninghams, a 1953 C3 Coupe, a 1952 C4R Le Mans racing replica, an Autokraft Cobra, a 1955 Chrysler 300, a 1978 Dodge Little Red Express pickup, a 1971 Monteverdi High Speed and a 1962 Buick Skylark convertible. Lutz said he raced briefly, but that it wasn’t a “glorious” racing career. Lutz also has nine motorcycles, including one in California and two in Switzerland. 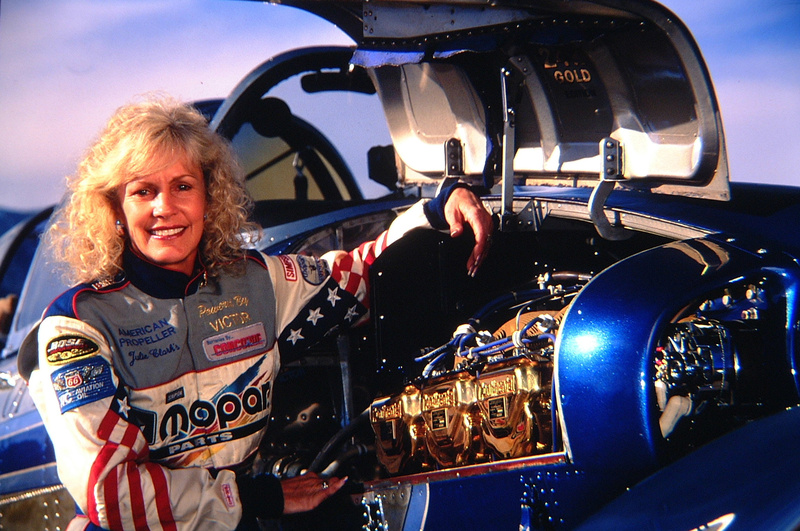 On March 31, Lutz arrived in Denver to be the keynote luncheon speaker at AutoVenture 2005. The fact that he exited the company Gulfstream V at Centennial Airport prompted a question as to what other aircraft General Motors utilizes. 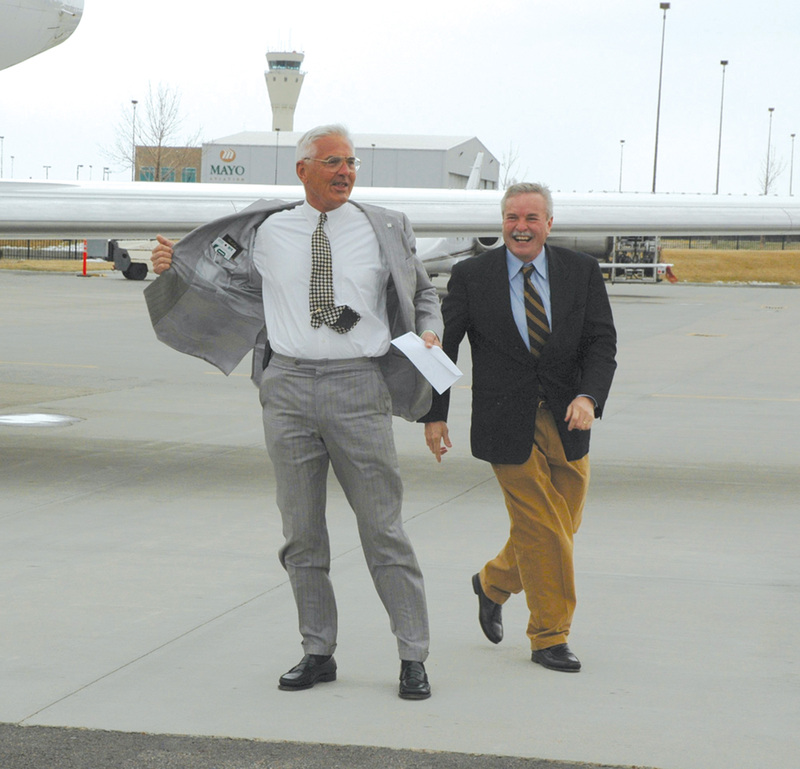 John McDonald, manager of communications for General Motors Air Transportation Services, said the fleet operates GVs and Citation Xs. He quickly added that Lutz stays out of these cockpits. “He’s not type certified to operate those aircraft and he does not fly them,” said McDonald. McDonald, whose position supports GM’s Economic Development and Enterprise Services Group, explains that the Enterprise Services Group includes worldwide travel, so corporate flight falls in their area of responsibility. He said that’s not only air travel, but ground transportation as well. “We have aircraft available for them to use when they would like to use them, and we also have a travel service that provides an interface through American Express to provide corporate travel services that include flight ops, like other aircraft that are operated on commercial airlines,” he said. He said GM’s corporate aircraft are also part of the Part 135 operation. 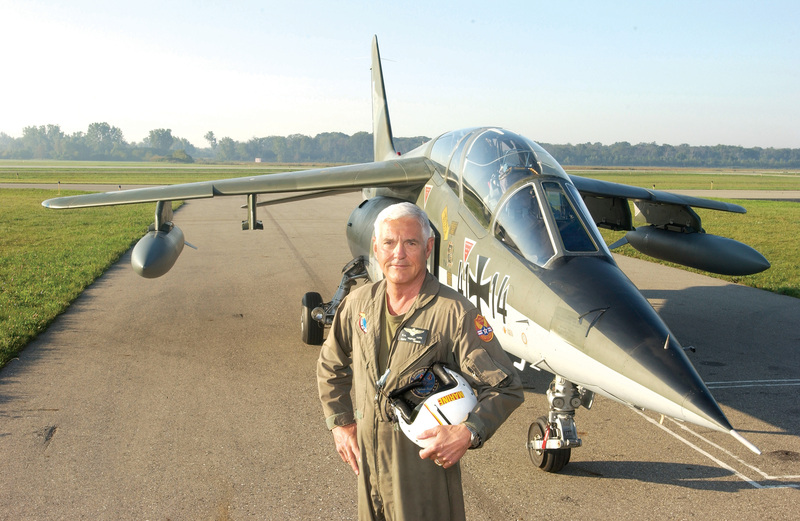 Bob Lutz, shown with Rick Millson, chief pilot for Alpha Jets USA and former U.S. Navy Blue Angels team member, acquired his German Alpha Jet last summer from Abbatare Inc.
“”I know Mr. Lutz is a very passionate aviator. He’s very committed when it comes to taking part in aviation activities, so it doesn’t surprise us he wanted to chat with you,” said McDonald. Although GM seems to have gotten used to his maverick behavior, Lutz’s past, and present, has raised a few questions. He was recently questioned concerning some of GM’s powerful cars, in particular the Cadillac XLR-V, which will be enhanced by a supercharger that will increase its power to 440 hp. Power and speed weren’t the only things on his mind back at Chrysler when Lutz dreamed up the Cobra-inspired Dodge Viper, which vastly affected the public image of the “dull, stodgy, beleaguered K-car” company, beginning with its appearance as a concept car at the Detroit auto show in 1989. In his book, Lutz spends quite a bit of time talking about right-brained (creative) and left-brained (rational) thinking, and said if ever there was a “right (and right-brained) product,” it was the Viper. Lutz didn’t need to look any further than Centennial Airport to find an example of a “right-brained” product in the aviation industry today. Before flying out of APA, he stopped to admire the Javelin mockup, and to discuss the tandem-seat, twin-turbofan executive jet with Charlie Johnson, Aviation Technology Group executive vice president of operations and former president and COO of Cessna. His interest in the innovative jet prompted the question as to what Lutz considered the single most significant aircraft and aircraft designer. 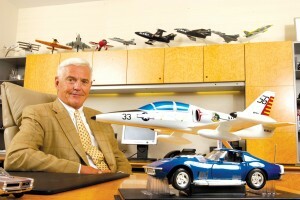 Bob Lutz said he’s never regretted his decision to give up a military career for the world of business, but did at one time suffer “occasional anguish” over not flying military aircraft. 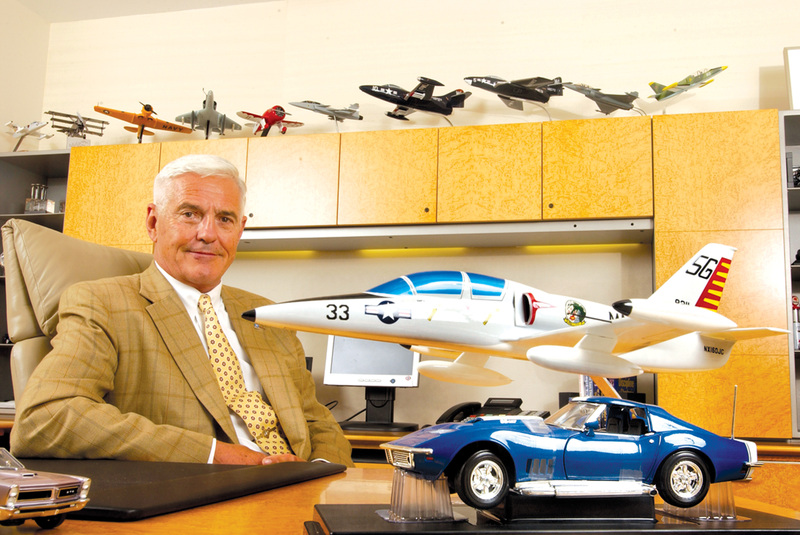 As far as aircraft designers, Lutz said that without question, Kelly Johnson gets his vote. “I have unbelievable admiration for that guy,” he said. That admiration goes back several decades. 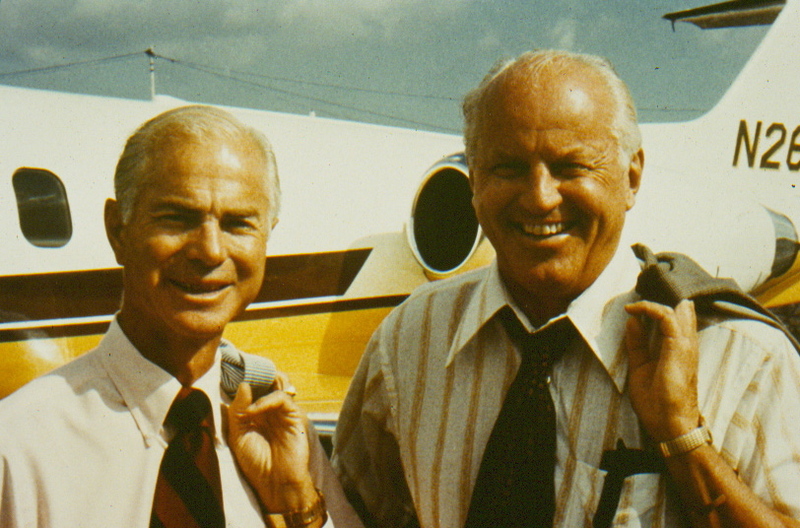 While at Ford in the early 1980s, for example, Lutz had an idea he thought would improve the company’s speed and lack of teamwork in product development. He invited Johnson, the head of Lockheed’s “Skunk Works,” to address the company. “They produced America’s first jet fighter, sketch to flight, in just 100 days, partly by cutting his engineering group from 8,000 to 800,” he said. Lutz had thought the message might help shake things up, but the response wasn’t what he had expected. Johnson’s hour-long talk on teamwork, elimination of waste, fast prototyping, and “all the other virtues that today’s product development experts hold dear,” got “hardly a rise out of Ford’s executives.” He says someone might have been influenced, though, because Ford, ultimately, did change. Lutz has been called in more than once to help troubled automotive companies. When asked to name an aviation-related company that he would’ve wanted to rescue, he again has a quick answer. He’s also given some thought to what other aircraft he might consider owning in the future. 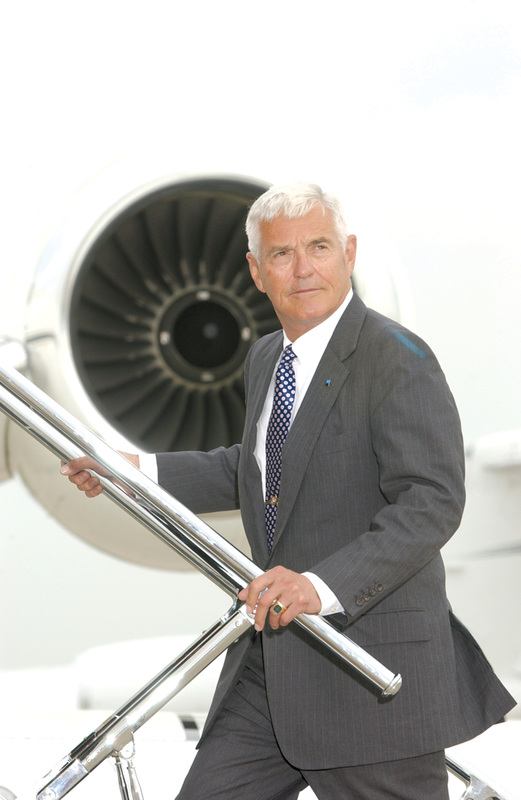 Bob Lutz flashes those gathered at Centennial Airport shortly before his takeoff. Airport Journals Publisher Jerry Lips is in the background. Lutz takes the longest time to ponder the question as to what aircraft he would change, if he could revamp even one.